There are many advantages to being a Blue Prism partner. You have access to the very best market software and facilities. You get to work alongside one of the most trusted and experienced names in automation. And you get the opportunity to be a part of the largest RPA forum on the planet by sponsoring Blue Prism World. Blue Prism began as an automation venture with a small group of tech developers headed up by Alastair Bathgate and David Moss. The business has since snowballed into a 600-strong workforce – with the company leaping into exciting new territory after coining the term “RPA” in 2012. Robiquity have built a terrific relationship with Blue Prism over the past few years, collaborating with them to offer our revolutionary ScaleSafe model and being named Blue Prism Training Partner of the Year in 2017 and 2018. 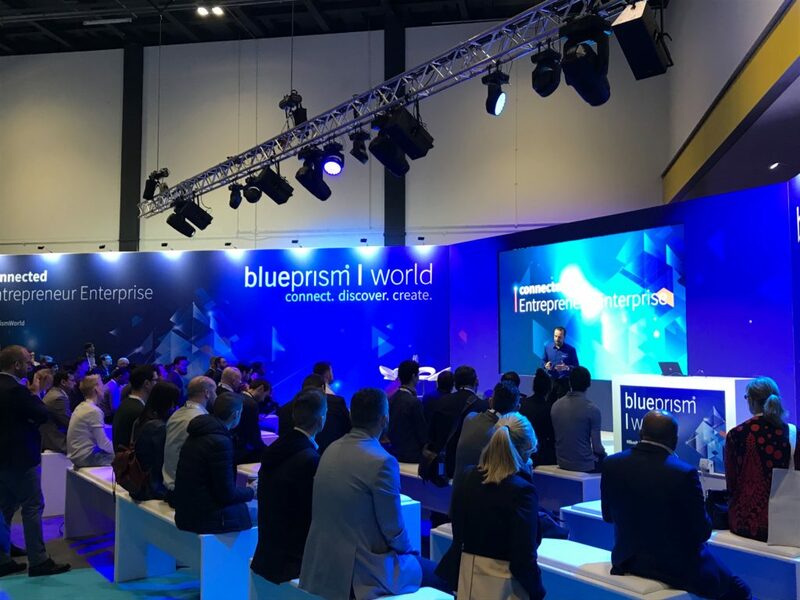 Full of anticipation for another edition of Blue Prism World this April, we took our team down to London and pitched up at the ExCel. In our latest blog, we look back over our experience and the major discussion points across the event. Between the keynote speeches, seminars and learning lounge sessions, a key obstacle kept coming up: the issue of scaling RPA. 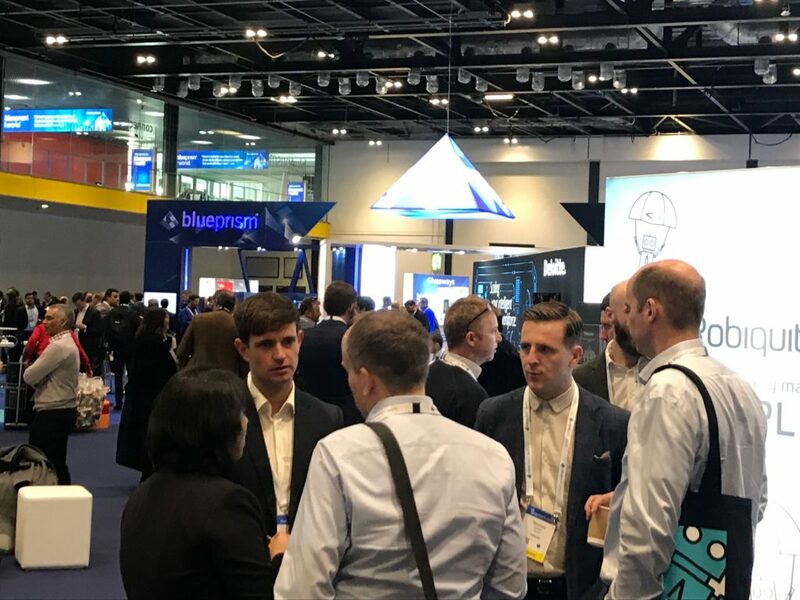 Many people approaching our stand said they’d experienced setbacks when attempting to take their RPA solutions to the next level, and it’s clear that scaling is the main challenge that businesses are facing when it comes to automation. Day one of the conference saw a panel approach the subject in more detail, with some companies claiming they’d improved scaling results by instilling their own cultures of continuous improvement, both companies explained the importance of thinking big (but starting small) as well as pushing organisation-wide commitment. Ultimately, every business is unique, which is why there’s no single recipe for success in scaling RPA. You need your own method. That’s why Blue Prism World proved to be the ideal platform to showcase our ScaleSafe model – which is tailored to your environment. ScaleSafe offers a fully-trained RPA team on-site in six weeks or less and a Blue Prism Developer Bootcamp – with your people protected from poaching for up to two years. This enables you to build an organic, multidisciplinary Centre of Excellence that sees high engagement and human-powered RPA. 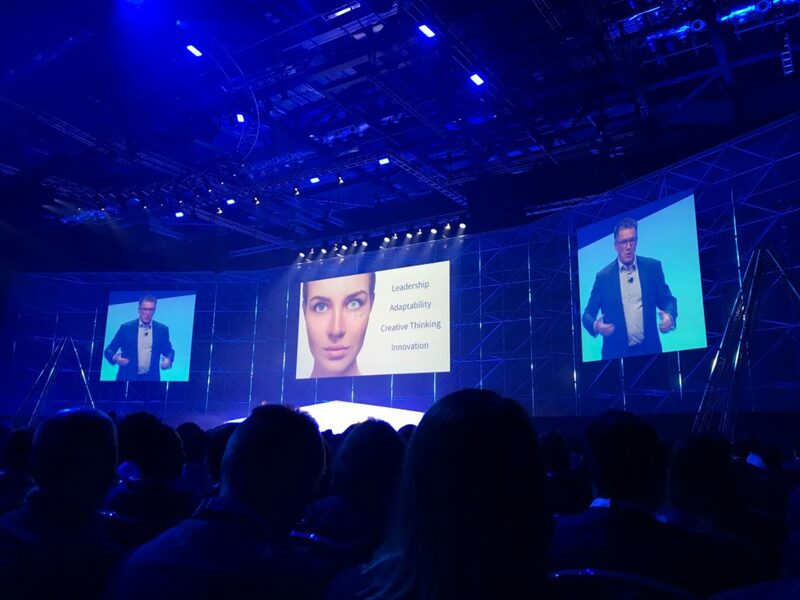 Another hot topic across the Blue Prism conference was the subject of people. Initially, many feared that robots were set to absorb jobs and diminish workforces – however more people are now beginning to realise that RPA is our friend and not a foe. In reality, human beings will play an essential role in the automated work environment. Robots are set to change jobs, rather than steal them. As Blue Prism co-founder Alastair Bathgate stated, the prediction is that 85% of tech jobs that will make up the market in 2030 haven’t even been invented yet. Following on from this, a Blue Prism panel with lead figures from Ernst & Young and Fidelity raised the question of whether the best digital strategy in the modern age is in fact a human one. The verdict was unanimous: RPA requires strong human engagement. Successful delivery involves an environment in which people actively interact with, and learn about, the technology – carefully considering which processes will benefit most from automation (rather than automating everything). Panel host Pat Geary, concurred that interacting with RPA in this way could see robots actually making us more human. And that’s definitely the Robiquity mindset. In our eyes, people are pivotal to RPA success. Instead of dropping in robots left, right and centre, we offer bespoke solutions that put people at the core. Throughout the conference, various Blue Prism leaders stepped up to showcase some of the different ways in which to navigate the challenges of automation using Blue Prism and complementary technologies – like ABBYY’s Optical Recognition Software. It was fascinating to hear how each company applies Blue Prism to their processes. Plus, we’ve also struck our own partnership with this innovative organisation to provide customers with access to machine learning and natural language processing. Incorporating ancillary technologies as part of Blue Prism RPA can add immense value, and to give businesses increased options in their RPA solutions, we’ve paired up with XpertRule – who, like ABBYY, had their own stand at Blue Prism World. With XR, Robiquity Blue Prism robots have a range of new capabilities linked to problem-solving, as well as human-robot collaboration. An awards ceremony on day one of the conference also paid tribute to some of the businesses currently implementing Blue Prism software successfully – with Jaguar Land Rover collecting the prestigious People’s Choice Award. The accolade was apt recognition of JLR’s commitment and capability in enabling RPA across business processes, with the automotive giant now realising more automation opportunities than ever before. Our approach to RPA is direct and effective. We keep things simple and we deliver. Every time. We enlighten businesses to the real possibilities of RPA – regardless of whether they are new to the technology or have tried and failed to implement a solution with another supplier. 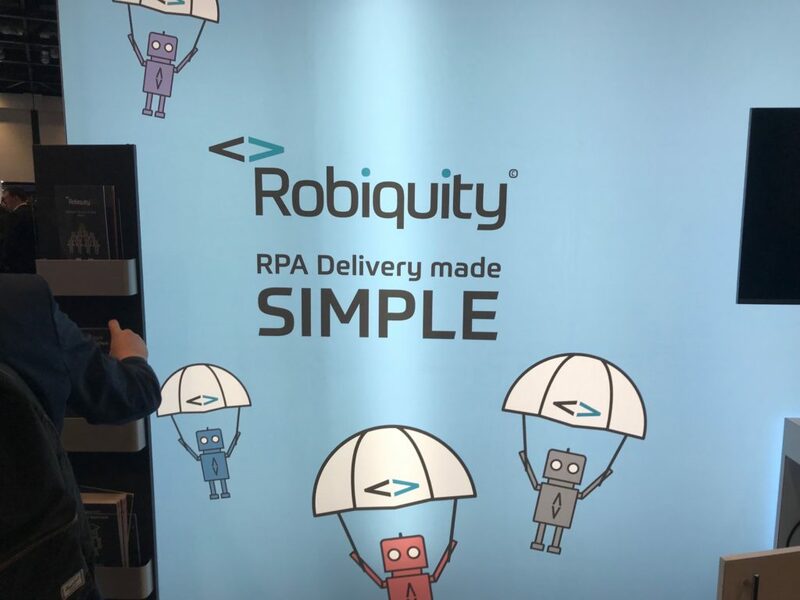 As a Blue Prism provider with a team of passionate RPA experts, there’s no-one better to turn to for automation solutions than Robiquity. If you didn’t catch us in London – there’s still chance to meet our team in Orlando! We’re heading across the Atlantic for the second part of Blue Prism World – which takes place on May 22-23. If you’re based in the UK, why not pop into our offices in Ancoats and get to know us over a coffee? We’d love to help. Get in touch today via 0161 974 3244 or info@robiquity.com.